"Guitar Acquisition Syndrome" (G.A.S.) is a great thing, at least for dealers like myself. It helps to ensure that there are always great guitars available on the pre-owned market. Offered is this fabulous D'Pergo Studio Soft Top built in 2006. I sold this incredible piece to one of my best customers last year. As fabulous an instrument as this is, G.A.S. is having it's effect, so I was able to buy it back from him recently for our inventory. 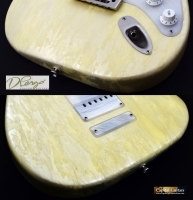 The specifications for this incredible D'Pergo electrinc include: a two-piece Basswood body with ivory pearlescent finish and a total weight of 7.7 pounds ; a Certified Old-Growth Maple neck in a Vintage Offset D-shape with a first fret depth of .920" and a super-smooth satin finish; a Maple fretboard with a 12" radius, 6105 fret wire, black dot inlays and a 1-5/8" bone nut; a 6 screw tremolo bridge with steel block and saddles; Sperzel locking tuning gears; Ivory Mica pickguard and cavity covers; and for electronics, two Pine Hill 23 single coils in the neck and middle position, a custom Fralin hand-wound PAF-style humbucker, a 2-frequency mid-boost system, and controls consisting of a 5-way switch, master volume, mid-boost level control with push/pull split control for the humbucker and a master tone control. 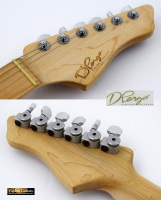 As a D'Pergo instrument, this guitar's acoustic resonance and touch-sensitivity are evident after playing just a few notes without amplification. The guitar's superb balance and the hand-finished contours of the body and neck make it extremely comfortable to hold and play. Stefan's incredible fretwork and the low and buzz free setup make for a guitar which seemingly plays itself. It feels, plays and sounds like the extraordinary instrument that it is. 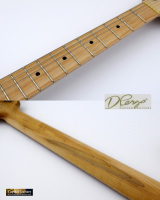 With it's Basswood body and Maple neck, this guitar has great tonal dynamics and a thick, fat tone. 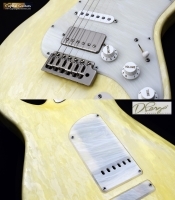 D'Pergo guitars have a Strat-like voice, but with additional complexity that you don't get elsewhere. The on-board electronics add a wide-range mid-boost system. With the mid-boost deactivated this guitar's tone is vintage Strat 'quack' with the rich tonal complexity you expect from a D'Pergo. Crank the mid-boost control for as much additional gain and sustain as you may require in any pickup position. A push-pull pot in this same control allows you to split the humbucker for even more flexibility. You will love the tone and output control that is at your finger tips with this amazing guitar! The included sound sample was recorded with the mid-boost at it's midway point. While built in 2006, this instrument is in superb condition. In fact, it is a work of art! This is very nit-picky, but just a small scratch on the cover of the humbucker, a couple of spots of oxidation on the bridge and a bit of discoloration near the A tuning gear are all that keep this guitar from mint condition. The frets are in near spotless condition. 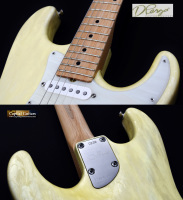 It comes to you in its original D'Pergo/G&G hard-shell case along with the drop-in trem arm, tools, Certificate of Authenticity and spec sheet. 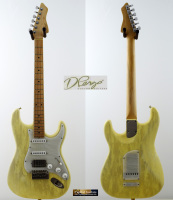 Don't just get yourself an electric guitar, get yourself a playable piece of sonic fine art with this incredible D'Pergo. You will be extremely glad that you did!